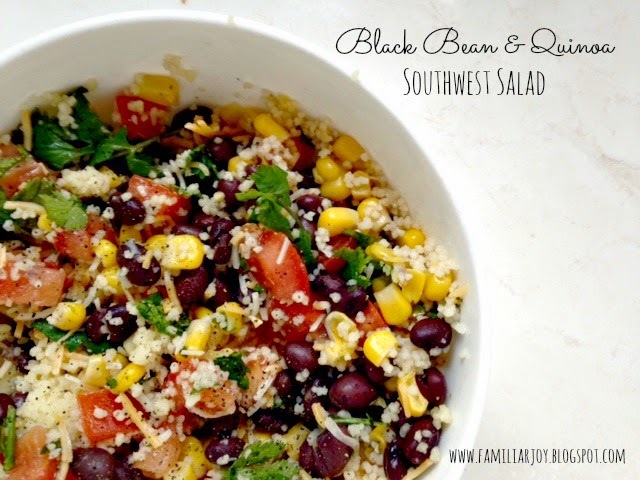 This first recipe is a yummy Black Bean & Quinoa Southwest Salad. Perfect for lunch or a quick dinner. We do either. Mix it all together, and voila! No, seriously, it's that easy. If you mix the quinoa in while it's hot, your cheese will melt and it will be more of a warm dish. I prefer to let my quinoa cool off and eat it as a cold salad. Either way, it's really good! My kids gobble it up and I love it because it's super healthy. I found this recipe on Pinterest and modified it a bit for our family. It's really yummy, super easy (just my style) and makes great leftovers. I'm actually having it for lunch, again, today. Lay the chicken breast on the bottom of the crockpot, cover in chicken stock, squeeze limes over the top. Then, chop onions and sprinkle over the chicken and lay cilantro on top of entire mixture. Stems and all! This is the chicken stock that I prefer to use. You can find it at Costco. I only used about 3/4 of this and put the rest in the fridge for later. Cook on low for 6-8 hours. Once done, remove cilantro and throw away stems and large pieces. Remove the chicken, shred and put in a bowl. Then, pour the liquid from the crockpot, over the top, mix together and add fresh cilantro and diced avocado. Roll up in tortillas and serve. What's cookin in your house this week? I'd love to hear! Linked up for the Hit Me with Your Best Shot! These look great. I love to make shredded chicken in the crockpot for tacos or bbq sandwiches. I will have to try that chicken stock. I like the reclosable lid, and Kirkland's brand is always great quality!